I hope you will enjoy the services we have to offer. To stop the music click on your browser's "STOP" button. Live Music for Your Party. Houston (TEXAS that is) or surrounding areas. Anything from Piano Solo to an 18 piece Big Band. You can send email by clicking here and I'll call or write back. If you are checking in or intend to purchase or download anything please send me some email. Anything from a leadsheet to full orchestra. All notation created with Finale. Ask for a sample page. You can read reviews of this site and what people have to say about songs they've purchased. All midi files are original and professionaly created. Many are available in sheet music (.pdf) form. 18 Thousand Titles available for sheet music and / or midi. If it's not listed on this site, send a request. For just $10.00 I'll create a lead sheet (Melody, Chords and Lyrics) in YOUR KEY, Send an email with your request. Just for you! You can contact me by clicking here. where you will find information about Piano Lessons, Arranging Lessons, General theory and much more. For those interested in arranging; the Johnny Warrington Series of Arranger Reference Library books. Originally published by BVC (Bregman, Vocco and Conn) in 1948. It was created for FUN and perhaps a few shekles. I really enjoy the people who get involved. By request I added a Short Bio of myself. Just below, my first TRIO in Houston featuring Peter Trout on drums and Bill Black on bass. Our staff will explain terms such as midi, pdf, midified, cds I sell. If you have questions, you still have to send an email by clicking here. MUSIC LIBRARY contains an index to thousands of print copies available by download or snail mail. Lead sheets, Piano Solos, Band Arrangements, and much much more! This is a shortcut to Al's Combo Arrangements. A FEATURED ARTIST (Stan Mark) Trumpet. has a selection of Music PERSONALITIES and Thousands of popular hits from the 30's through 1970. Look here for piano solos (midi and sheet music) in the style of.. The sheet music of popular tunes for piano and vocal, with some "pop" piano solos. Listed in alphabetic order. No drinks are served (yet), but you will find a selection of midi files typeset with FINALE notation software. The difference between this music and the type you find in the usual music store is it can be played! Only soft drinks and hot dogs are served but the music is what you expect. Dug up a lot of historic soloists for this place. If you really, really LUV! stride piano you must check out our RAGTIME piano room for more midi and sheet music listed by artist or composer. Or you might prefer trying some boogie woogie duets. Four Hands - (One or two Pianos) Duets of Cole Porter Songs (midi and sheet music) or My Fair Lady piano duets, or you can try your hand(s) at boogie woogie duets. And there are even more classical duets listed in our concert hall . 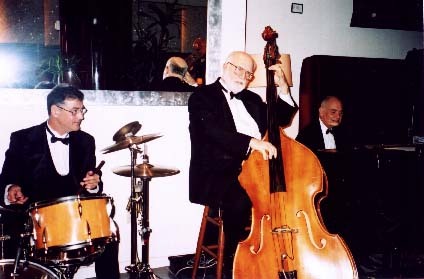 The STARLITE ROOM features arrangements of BIG BAND HITS. presents many composers (midi and sheet music) from BACH to the present. Short piano pieces to very long symphonies all scored, ready to play on your sound card or real performance. The EMERALD ROOM plays host to the house band. The LFO Orchestra, is conducted by Al Levy and available all the time. Hear songs from Broadway shows all ready to be played by your midi sequencer + some piano duets. To Check Out AL'S LFO POPS ORCHESTRA CD click here. Please send all comments to our email address: Al Levy Musician at large. All the contents of this site are copyright (c) 2019 by W.T.M.